TheDungeonRat's tabletop RPG reviews, DM tools, and full character sheets; the home of Toon Tuesdays and some other geeky things. UPDATED 11/2014: See “Character Creation”, just after the old, striked text. Publisher and Author: Ill Gotten Games and Arian “Dutchmogul” Croft. Availability: Paperback is available for purchase online for $25 through Lulu. 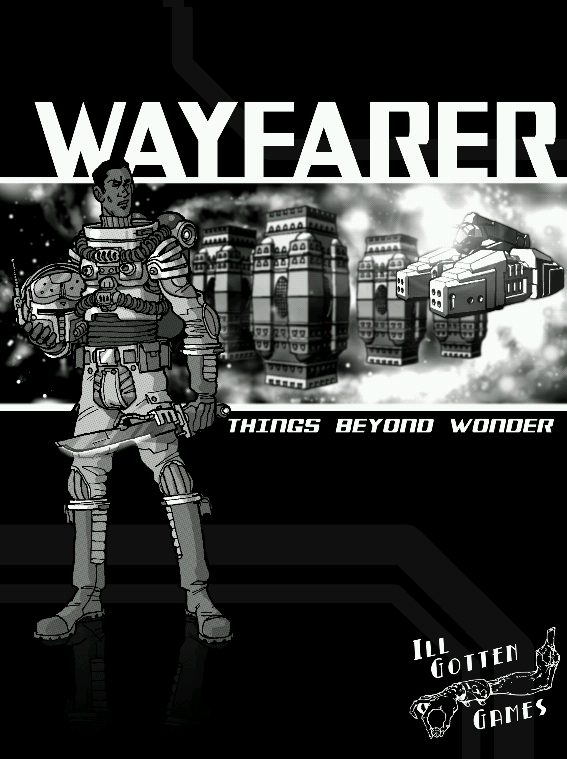 As I received both the physical and digital copy of Wayfarer through the original, succesful Kickstarter project, I was delighted to hold it in my hands just a few months after I had previously featured it, safely delived to me via media mail in a bubble envelope. The physical book is roughly the same size as your average role playing text, it stacks nicely beside my numerous Rifts books, and is composed of high quality paper and a tough paperback cover. The cover itself is in nearly pristine condition, the only error being that the barcode is very blurred and probably unusable (a printing error, it seems), and is very stark and set apart with its mostly black background. The text is clean and not smudged, no errors which I have found, and with very clear images, even in its black and white print. 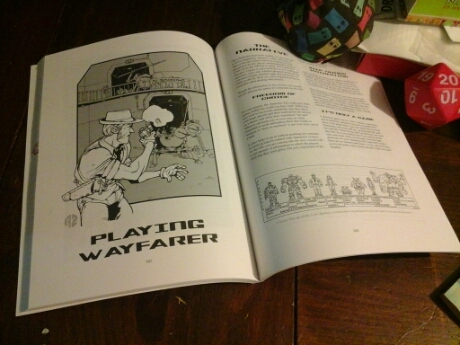 Oftentimes when I buy a new book, especially an RPG, it smells a bit like a newspaper for the sheer amount of ink pressed within, however, Wayfarer delightfully has none of that almost plastic odor. As for the digital copy, it is a straight forward .pdf file, easily and quickly downloaded, with the full contents of the book represented by clean, easy to read text and images, even on mobile. The only things which could have made the digital version better are if there were preset bookmarks for easy navigation, the ability to copy and paste text for even easier character creation, and a digitally fillable character sheet. As it is, I’m doing just fine without said amenities and the quality of both editions are very satisfying. Interested in RPG posts? I do full character write ups, RPG product reviews, as well as up and coming RPGs from Kickstarter! I also review other geeky things; unboxing, comics, board games, and so on! I take character requests, but also hit me up if you have any comments or concerns - or just to talk about RPGs! I also accept commissions for pixel art or cartoon character designs; let me bring your perfect logo, OC, or icon to life!